Animal Behavior, Second Edition, covers the broad sweep of animal behavior from its neurological underpinnings to the importance of behavior in conservation. 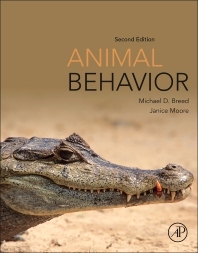 The authors, Michael Breed and Janice Moore, bring almost 60 years of combined experience as university professors to this textbook, much of that teaching animal behavior. An entire chapter is devoted to the vibrant new field of behavior and conservation, including topics such as social behavior and the relationship between parasites, pathogens, and behavior. Thoughtful coverage has also been given to foraging behavior, mating and parenting behavior, anti-predator behavior, and learning. This text addresses the physiological foundations of behavior in a way that is both accessible and inviting, with each chapter beginning with learning objectives and ending with thought-provoking questions. Additionally, special terms and definitions are highlighted throughout. Animal Behavior provides a rich resource for students (and professors) from a wide range of life science disciplines. 1.6 The Study of Animal Behavior: Where Did it Come From? 2.2 What Does an Animal Behaviorist Need to Know About Neurobiology? 2.3 What Does an Animal Behaviorist Need to Know About Endocrinology? 2.4 What Does an Animal Behaviorist Need to Know About Sensory Systems? 6.7 Are Cognitive Abilities Under- or Over-Attributed to Animals? 11.6 Mating Systems: How Many Males, How Many Females? 13.2 Altruism or Selfish Interests? After receiving my PhD from the University of Kansas in 1977, I came to Colorado to work as a faculty member at the University of Colorado, Boulder, where I have been ever since. I am currently a Professor in the Department of Ecology and Evolutionary Biology, and I teach courses in general biology, animal behavior, insect biology, and tropical biology. My research program focuses on the behavior and ecology of social insects, and I have worked on ants, bees, and wasps. I have studied the nestmate recognition, the genetics of colony defense, the behavior of defensive bees, and communication during colony defense. I was Executive Editor of Animal Behaviour from 2006-2009. As an undergraduate, I was inspired by parasitologist Clark P. Read to think about the ecology and evolution of parasites in new ways. I was especially excited to learn that parasites affected animal behavior, another favorite subject area. Most biologists outside the world of parasitology were not interested in parasites; they were relegated to a nether world someplace between the biology of free-living organisms and medicine. After peregrination through more than one graduate program, I completed my PhD studying parasites and behavior at the University of New Mexico. I did postdoctoral work on parasite community ecology with Dan Simberloff at Florida State University, and then accepted a faculty position at Colorado State University, where I have remained since 1983. I am currently a Professor in the Department of Biology where I teach courses in invertebrate zoology, animal behavior, and history of medicine. I study a variety of aspects of parasite ecology and host behavior ranging from behavioral fever and transmission behavior to the ecology of introduced parasite species.